I have had the good fortune to work on two great collectible trading card sets for Cryptozoic Entertainment – Season One and Season Two of the Outlander TV series. It’s a unique style of short-form storytelling in that it asks you to beat out the major events of an entire TV season across a limited number of cards with severely limited text space. When Cryptozoic reached out to me, I was understandably excited to be offered such a high profile card set. The project was a good fit for me. Nearly my entire body of work is in short-form: comic books (22-page installments with a beginning, middle, and end), videogames (told in bursts of dialogue or in short cutscenes between levels), and web comics (more akin to comic strips than comic books), and much of that had been in the fantasy genre. I also have a solid reputation for working with licensors and getting first round approvals. Having said that, I had never worked on a trading card set before. Although I was confident I could execute the project, I did some initial research before committing. Unusual assignments like these often have tight deadlines as well. This one had a 60-day turnaround, so it was a “hit the ground running” kind of commitment. It’s also completely solo work. Once they sent me the template text file, the rest was up to me. So, what goes into writing for a licensed collectible trading card set? Note that this not a trading card game – there are no stats or abilities that have to be incorporated. The emphasis is on character and story, not gameplay. Follow the story of Claire Randall, a married combat nurse from 1945 who is mysteriously swept back to 18th century Scotland. When Claire is suspected of being an English spy, she is forced to marry Jamie Fraser, a chivalrous Scottish warrior with a price on his head. What she doesn’t count on is falling in love with the young Highlander and being torn by her loyalties to two men in two vastly different eras. But when the Redcoats finally catch up to Jamie, Claire risks everything to save him from a death sentence and the monstrous “Black Jack” Randall. If you’re not already familiar with trading card sets, character cards depict an image of a character along with their character name, and a space on the reverse side for a character description. In the case of the Outlander set, the text limitation was 150 characters, including spaces. Not a lot of space. You have to distill a character’s essence down to a couple of sentences. As you first approach your strategy for describing beloved series characters, it’s easy to draw on events in the story, but what they’ve done is not what you’re after. What you want is to convey is who they are. What are the character’s overriding personality traits? What makes them quintessential to the core story premise? How do they differ (in outlook, demeanor, and/or ambition) from the main character(s)? Use broad strokes for the “facts” balanced with unique details that make that character stand apart. When in doubt, look for conflict. And as much as possible, use full sentences. An intelligent and honorable clan lord, Jamie, a natural leader, wants nothing more than to live out a peaceful life on his family’s ancestral farm. “Intelligent”, “honorable”, “a natural leader”… all important traits to understanding Jamie’s noble character. But why is the second part important? Because everything in the ensuing story thwarts his efforts to live out the peaceful life he craves. That’s the character’s core conflict in the story… get it? Handsome, manipulative, and ruthless, this skilled sadistic Captain of the English Army harbors an unhealthy obsession for both Claire and Jamie. So, Randall is sadistic, a man of influence, and obsessed with the main characters? Yep, smells like conflict to me! When I was sent the Season Two set, there were, of course, several repeated character cards. It wouldn’t have added any value to the set to simply repeat their original character descriptions – and more to the point – in the best of stories, characters evolve. How were the main characters changed by the end of Season One? What are the new conflicts they face as they enter this new phase of the story? For this project, there were 71 story cards for each of the Season One and Season Two sets. The cards had images on both sides – one side for a title (up to seven words) and the other for a short description (again, 150-character limit). It is your job to do justice to the fans of the franchise while not letting the cards read as dull or mechanical. Setting up questions or conflicts in the title engages the fan immediately in the events of the story, and if you’re doing it right, makes them eager to turn the card over to see how the intrigue plays out. The first title implies clear conflict, the second sets up two questions (just what was the price, and who was it that needed protection? ), and the third references a building tension that finally finds resolution. Because of the limitation of space, take advantage of familiar turns of phrase, colloquialisms, or stereotypes. They do more “work” for you by creating fast, familiar images in the fan’s mind. Don’t forget that any detail offered in the titles does not need to be repeated elsewhere. Save flavor text to supplement or give more detail about what has already been conveyed. The flavor text on the back of the card is set up to deliver on the title question or conflict. This can be done with simple description, or a combination of description and thematic quotes from individual episodes. Flavor Text: Foraging for a medicinal plant, Claire hears a howling sound coming from one of the stones. She touches it. The world suddenly spins out of control. The real magic is in weaving the title together with the flavor text which, by complement or by contrast, creates a story moment that is more than the sum of its parts. Title: Possession or Accidental Poison? Flavor Text: Claire saves Mrs. Fitzgibbon’s nephew from a priest who is about to perform an exorcism. Rumors of the “Miracle Worker” circulate through the village. Flavor Text: Claire joins Dougal and the men on a trek through Mackenzie land. Jamie doesn’t believe her to be a spy, but knows she’s hiding something. Take advantage of any opportunity to use words with double meaning that can be further enriched by the flavor text. Flavor Text: Claire discovers Douglas is secretly raising a Jacobite Army. She meets some local highlander women and asks about Craig Na Dun. It’s three days away. The title, Rebellion, sets up clear conflict. But who is the rebel, Dougal (who is secretly organizing the Jacobite Army) or Claire (who is desperate to get back through the stones to return to her own time)? Could it be both? In short-form storytelling, you have extremely limited word real estate. Choose highly descriptive adjectives and only active verbs (the only exception is if you’re having to edit for space limitations). It should be said that that you can’t always accomplish greatness with every card. Sometimes you have no choice but to respond to the limiting art the licensor has provided, and sometimes you simply need to move the story forward. With such complicated events such as this series contains, there will be some cards that feel a bit more like “information maintenance” or exposition. These have their place. Having said that, do your best to give these cards as much literary “texture” as you can. Flavor text: Taran’s men are ambushed, and Jamie is taken by the Redcoats. Claire and Jenny go after him. They find the ambush site and track the men to the east. Well, there’s my primer. Remember, you’re creating one big tapestry of words that will, when woven all together, paint one large rich picture of humanity in all its shades, and you get to choose the threads. I can honestly say I love what I do. Every project is a new and wonderful challenge. The learning never ends. That’s right. Jenna Strange and her friends find themselves caught up in a 300 year old mystery.. now available on the Apple iBookstore! Check out my paranormal middle grade adventure here. Comments Off on Secret Letter Society trailer is live! Comments Off on Goodreads Giveaway! Enter to win a free paperback copy of The Secret Letter Society. It’s official: my middle school novel has finally left the nest! I even have an official Author’s Page (if you click on my name), which links all my old comic book properties, to boot! Woohoo! 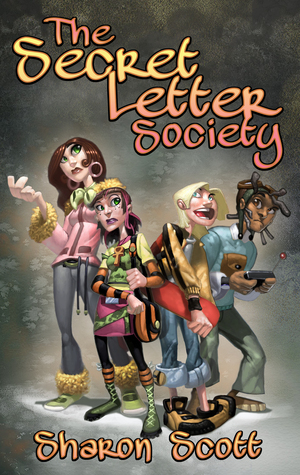 Online Book Club gives Secret Letter Society 4 out of 4 stars! Read the review here. Get the book here and leave a positive rating if you enjoyed it! With the horror script draft complete (currently awaiting feedback from the producer), it’s time to move on to the next project. A supernatural thriller. The story has a strong commercial hook, but I’m thinking of aging the characters down to high school age to really give it some edge. I am thinking I will write it as a screenplay first, then adapt it to a novel. With the horror film structure pretty much in place, it’s time to re-focus on the as-yet-unannounced game based on a popular TNT TV show, at least for the next week or so. I was on the phone recently with a producer making final touches to a thriller film treatment.